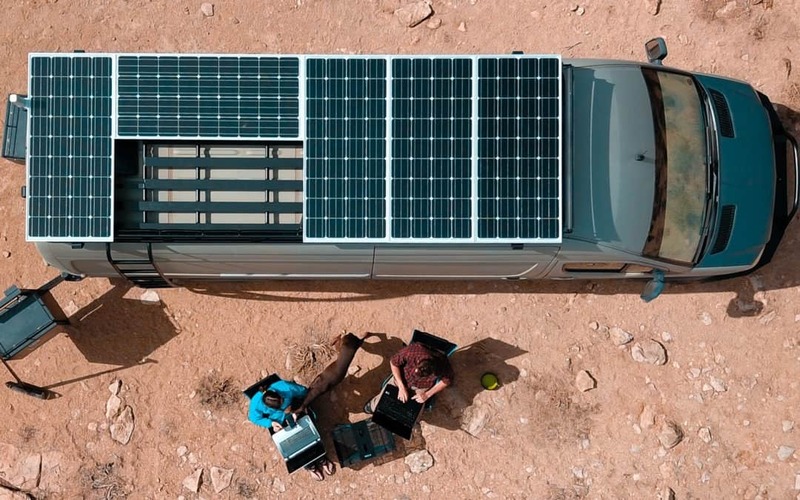 Solar panels take the energy from the sun and send it down through a charge controller where it will eventually recharge the batteries in your Camper Electrical system. “How many solar panels do I need to power a camper”? First off… Stop thinking in ‘number of solar panels'. Solar panels are measured in watts. 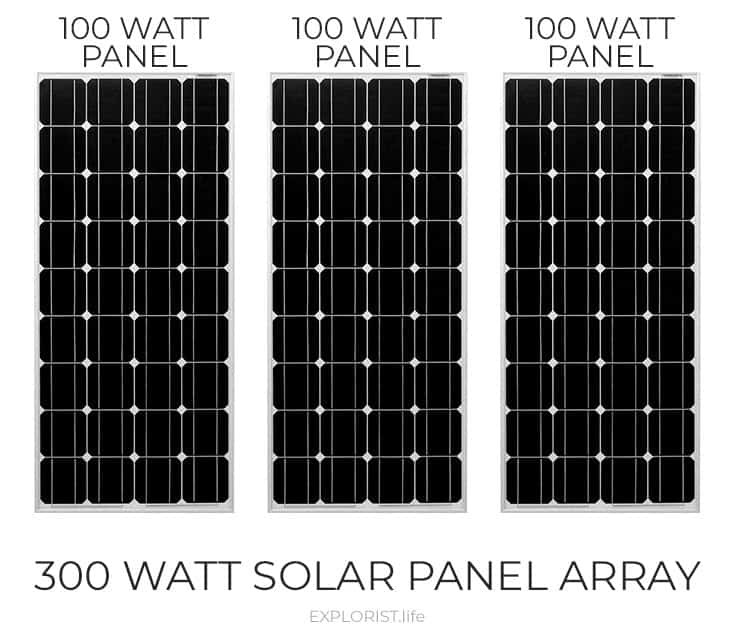 There are 100, 170, 200, 225, 265, 300, 335, and 360 watt solar panels. I missed a few, but the point is, there are MANY different sizes of solar panels on the market and 3, 100 watt solar panels will have the same output as a single 300 watt solar panel. So: The number of solar panels doesn't matter. What DOES matter is the total wattage of the entire solar panel array, which is the wattage of the individual solar panel multiplied by the number of solar panels you have. 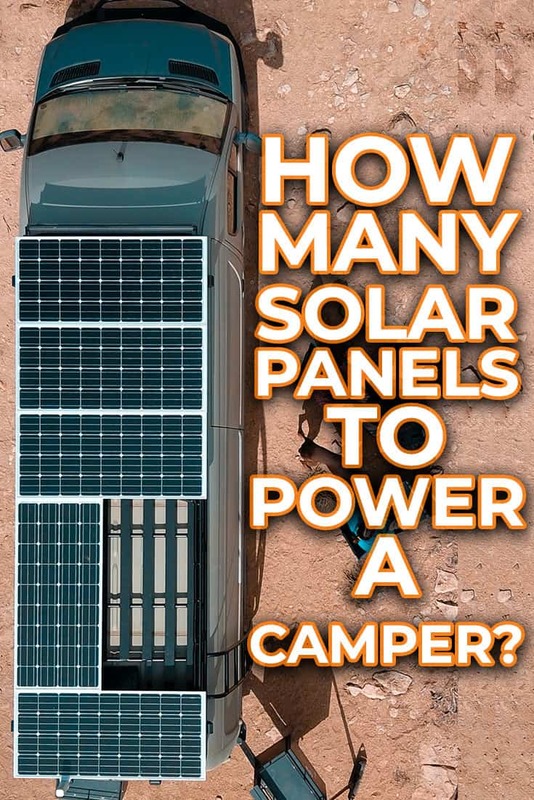 How Many Watts of Solar Panels are Needed to Power a Camper? Now that you are thinking in terms of the size of the solar panel array, it's time to determine how many WATTS of solar panels you need. 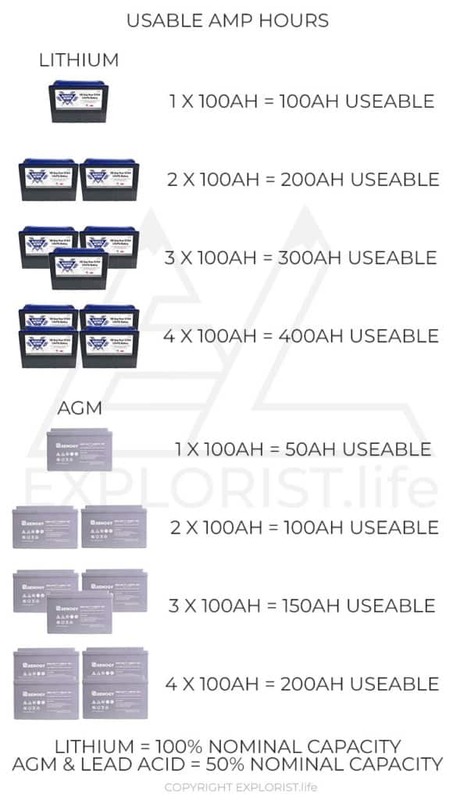 You've already figured out how many amp hours of batteries you need from your solar power audit. We will be working off of that number. More specifically, we will be working off of the USABLE amp hours of your batteries. You need your USABLE battery capacity to determine wattage of solar panels. Your batteries should be sized for your electrical demands. Your solar panels should be sized to recharge your batteries. How Many Watts of Solar Panels do I need to Recharge my Batteries? The average hours of sunlight per day in the continental US is 6 hours. A battery holds about (100ah x 12.8 volts =) 1280 watts of power roughly. Key Takeaway: Estimate 200 watts of solar panels per 100 amp hours of useable battery capacity (100Ah Lithium or 200Ah AGM). BUT KNOW THIS: More solar panels are just going to charge your battery faster, or more adequately in low light conditions. If you have 400 watts of solar, you will charge twice as fast. Increasing the number of solar panels will also help compensate on cloudy days. Key Takeaway #2: If you want more battery capacity than you have roof space for solar panels, that's fine! You will ALSO be charging from your alternator and you will also have the option to charge as needed from shore power, or a plug-in at, say, a house, campground, or even a generator. This system is all about being versatile. I recommend 200 watts of solar panels per 100 useable amp hours of batteries as a base guideline. Once you know the total wattage you need, you can divide the total wattage up into the individual solar panels you would like, which will likely be based on roof space available. Systems bigger than 600Ah & 1200 watts are still completely doable but are uncommon. Thanks for educating me within a short time. Under common battery and solar panel combos I dont see a 100 amp lithium and 200 watt solar combo. It looks like you recommend 100 amp and (2) 175 watt panels. The 100/200 combo would be enough, right? This info is awesome! Yep! A 100Ah, 200w setup would be good as well! I want a massive setup with like like 1200 watts and 1200 Ah battery bank. Is that possible on a van? I know that you can charge with the alternator but what about carrying around a little honda generator when you aren’t traveling or an inverter generator, would that help charge up the battery bank also ? That depends on how depleted the batteries are, the size of your charger, and the size of your generator. Your site and videos have been life changing to our process! Thank you for sharing your knowledge! We have 2 100watt Renogy solar panels and plan to purchase one lithium battery from your combo link above. Our question is about the inverter. When looking at inverters from the site, the inverters start at 2000W with a heavy price tag. Is this because its primed for a much larger set up than we are working with and needing? We have a very tight budget, and top recommended inverters like the novopal 1000W Pure Sine Wave Power Inverter are very affordable. We don’t want to buy something cheap, but can’t afford to overpay for something not necessarily needed.